International labor migration has increasingly risen in importance associated to the ways in which the global economy is operating. Countries from all parts are seeking foreign labor as a way to compete in the global economy. Moreover, the economic activities that foreign laborers perform in their home countries are increasingly having positive effects on their home countries. For example, the relevance of remittances in the development and economic policy contexts has been underscored by the large volumes of money going to Latin America and the Caribbean. This flow of money emerges in particular as a function of greater labor mobility on a global scale. Remittance flows have grown dramatically over the past ten years, as shown in Table 1. Another important trend is the continuing price competition in the industry, which benefits consumers. The cost of sending money to Latin America and Caribbean countries has dropped over time, but the decline has slowed significantly over the past three years (see Table 3). These costs have remained relatively stable, partly because the current business-agent based model of remitting has reached equilibrium between operating costs and revenue needs. Amid these changes, remittances to Cuba from the U.S. continue to pose challenges. For example, there are fewer competitors in that corridor than anywhere in the region, and prices are the highest. One of the reasons for this situation is the 2004 U.S. legislation that led to increased informal fund networks and lower competition. Regulations by the Bush administration did have an adverse effect on money transfers to Cuba. On June 16, 2004, President George W. Bush introduced some of the tightest rules in the last four decades on travel and remittances to the island.2 The rules focused on five activities related to remittances sending to Cuba from the United States, such as the amount, beneficiary, and required paperwork from the sender. First, the new regulations capped remittances at US$300 per household per consecutive three-month period. Third, the 2004 restrictions allowed U.S. senders to remit an additional US$1000 on a one-time basis to enable the recipient to emigrate to the United States. This “emigration remittance” was divided into two parts. A single remittance of up to US$500 could be sent before the recipient received a U.S. visa or other valid U.S. immigration document, and another US$500 after the visa was received to help pay for travel expenses. Licensed travelers could only carry “emigration remittances” to Cuba if their family member had already been issued the visa. Fourth, the 2004 changes introduced a stricter licensing system for service providers, eliminating a general license and requiring banks and money transfer operators to obtain a specific license to send remittances to Cuba. When sending money to Cuba, remitters must use an OFAC-licensed bank or money transfer operator (called “remittance-forwarding service providers” by OFAC). On a case-by-base basis, OFAC may issue specific licenses to send money to independent NGOs in Cuba, to send more than US$300 per quarter from blocked accounts to households of Cuban nationals living outside of Cuba,5 and to individuals in Cuba to facilitate their non-immigrant travel to the U.S. due to humanitarian need, such as illness or medical emergency. 6 Remitters were required to fill out and sign an affidavit certifying that they understand and comply with Cuban Asset Control Regulations (CACR). They must provide the recipient’s name, address, date of birth, and relation to the sender. The sender must provide their own name, address, phone number, mother’s maiden name, date of birth, and relation to the recipient. Remittance service providers must keep these affidavits, which are subject to OFAC audits, on file for five years. Fifth, the 2004 restrictions also limited the amount of money travelers could carry to Cuba and placed tighter limits on gift parcels. In 2003, the amount travelers could carry was upped to US$3000, but in 2004 it was capped at US$300. The retail value of gift parcels was capped at US$200 and one parcel per month, which could only be sent to a religious, charitable, or educational organization in Cuba, or to the sender’s immediate family. The effect of the 2004 regulations was immediate and impacted various aspects of money transfers to Cuba. First, the volume of transfers dropped. Second, informal funds transfers were used more regularly. Third, transfer costs increased. Fourth, the Cuban government responded to the Bush policy with laws levying a tax on dollar currency exchange and restricting the use of the U.S. dollar on the island. There were other impacts on the nature of remitting, such as a reduction in the number companies offering to transfer money. Here we review some of these issues relying on surveys and other information. Decline in Volume of Remittances from the U.S. Although the regulations were changed in June 2004, the effects began to take place in 2005 and the bulk of the impact has accumulated over time. Comparing 2005 and 2009 survey data, we see a significant decline in some remittance-related activity.7 Specifically, because the new rules restricted the type of beneficiaries, the number of recipients dropped. In 2005 the percent of Cubans receiving from relatives in their extended family was 34%; by 2009 the number had dropped significantly to 15% (see Table 4). This means that, five years later, 20% of people with extended family in the U.S. were no longer receiving remittances. Another effect of the new rules was a decline in the volume of money transfers from U.S. residents to the island (see Table 5). Overall remittances to Cuba continued to slightly increase after 2004, but that growth is mostly attributed to transfers from outside of the U.S. Using data developed by the Inter-American Development Bank (IADB) we find that in 2005 remittances were $1.1 billion and $1.2 billion in 2008. Moreover, survey data in 2008 showed that only 53% of remittances recipients in Cuba in 2008 were receiving such remittances from the United States, compared to 81% in 2005. 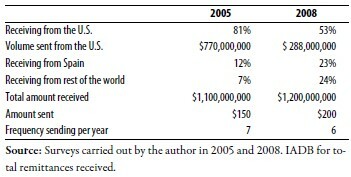 The decline was significant as in 2008 less money was being sent from the U.S. In addition, there is a change in the number of people saying they were remitting less. As Table 6 shows, the percentage of people remitting the same quantities dropped, while those remitting less increased. This result coincides with their frequency in remitting, too. Another significant change in the patterns of transfers was an increase in the use of informal mechanisms. Informality of remittances to Cuba has been historically high due to U.S. restrictions in amounts remitted. Most important, informality has grown dramatically in the last few years since the 2004 restrictions. 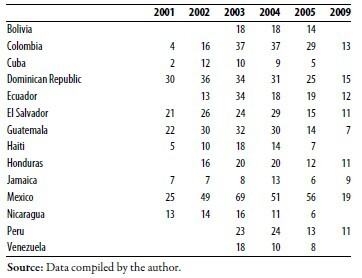 As shown in Table 7, the percent of transfers through formal money transfer operators (MTOs) in 2005 were 82% and only 18% were done through informal travelers (“mulas”). By 2008, informality grew, as only 56% of flows were through MTOs and 44% through informal mulas. Table 6. Sending Remittances to Cuba from the U.S. Meanwhile, some companies entered into the market between 2001 and 2004 but many had exited by 2005. Table 8 shows a decline in the number of active companies identified as operating in the U.S.-Cuba corridor. Overall, the increase in informal funds transfers is in large part a reaction to the legislation. Those wanting to remit to Cuba thus had to find an alternative mechanism that offered more flexible options. The use of mulas emerged again as an important mechanism (as shown in Table 7). 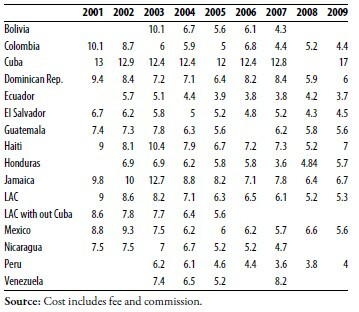 Accompanying this situation came an increase in costs of remitting to Cuba (see Table 9). The cost in late 2008 was over 16% of the value of the principal remitted. Trends in transfers to Cuba have not been positive and rather gone in the opposite direction of other markets despite of interest by senders to have more efficient methods of remitting and changes in legislation. As the section above showed, the 2004 Bush Administration policy had an effect on the flows to the island. Overall these changes delayed competition and technology innovation on a population that may be interested in using alternative but legal methods of remitting. Current changes by the Obama Administration might lead to new competition patterns. Early in 2009, President Obama said he would “remove restrictions on remittances to a person’s family member in Cuba,”9 effectively reversing many of the Bush Administration’s 2004 CACR restrictions, but still keeping in place some others. The President’s April 13, 2009 policy announcement called for removing limits on the amount of money and frequency of sending, as well as expanding the circle of family members who can receive remittances. The new policy calls for authorizing remittances to individuals within three degrees of family relationship (such as a second cousin), while it maintains the prohibition on sending money to members of the Cuban government or prohibited members of the Cuban Communist Party. President Obama’s changes also make the licensing process for money transfer operators less restrictive, reinstating the general OFAC license which had been eliminated by President Bush under the 2004 rules. President Obama also called for raising the limit on money travelers can carry into Cuba from $300 to $3000. 4. U.S. Department of Treasury, Office of Foreign Assets Control, page 4. 5. “An estate becomes blocked whenever a Cuban national is an heir or is the deceased; money from a life insurance policy is blocked whenever the deceased is a Cuban resident. The heir of a person who died in Cuba, or the beneficiary of a life insurance policy of a person who died in Cuba, may apply for a specific license from the Office of Foreign Assets Control to unblock the estate or insurance proceeds … authorized remittances may be made from blocked estates,” U.S. Department of Treasury, Office of Foreign Assets Control, page 4. 6. U.S. Department of Treasury, Office of Foreign Assets Control, page 4. 7. 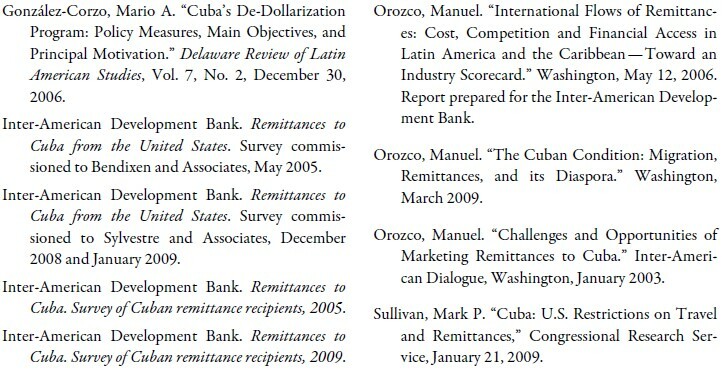 To analyze changes in the remittance market the author relied on various surveys of Cuban senders and recipients carried out in 2005 and 2009. See the list of references at the end.